Hayley Coutinho, a PPC expert at Receptional Ltd shares her experiences using Google AdWords review extensions. This article includes advice on how to setup review extensions to get the most out of them. 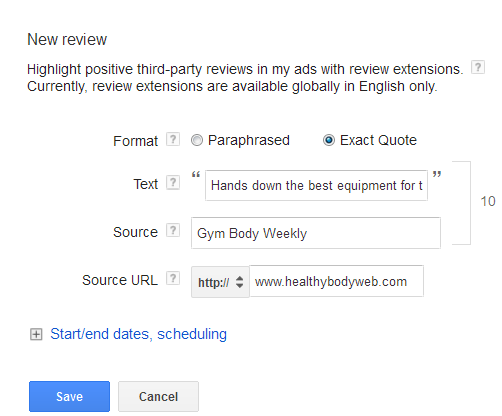 The Google Adwords Review Extension is a must-have for businesses looking to boost their return on investment. Our trials of review extensions have seen improvements in click through rates (CTRs) of up to 66% – a significant increase. The review extension does what it says on the tin – allows users to opt to display website, service or product reviews as part of the Google AdWords PPC advertisement. After all, what business doesn’t want to let the world know when they’ve got a host of 5-star ratings to their name? After its initial beta release in 2013, the review ad extension has now been rolled out universally, so anybody with an AdWords PPC campaign can opt in. Yet many businesses haven’t grabbed the opportunity to amplify their ads’ CTRs using this simple but effective tool. Since around 90% of consumers claim that online reviews influence their buying decisions, when it comes to displaying your stellar reviews in premium advertising space, it’s a complete no-brainer. Just as call extensions (telephone number), sitelinks (website address) and location extensions (address) add vital data into a Google AdWords PPC ad, the review extension provides the opportunity to display another vital piece of information that will build trust and entice potential customers to make that all-important click through. For the sake of a few minutes’ work, there are a whole host of benefits to be reaped from opting into review extensions. Firstly, with many paid search advertisers yet to take up the review extension, there is an opportunity for early birds to stand out from the crowd. Secondly, implementing review ads could set off a positive chain reaction – the increase in CTR provides an opportunity to really boost conversions and increase traffic to your website, which in turn can positively impact quality score, ultimately resulting in a reduced cost per click (CPC). The review ad extension also presents an opportunity to enhance customers’ perceptions and preconception of the brand. And with around 44% of shoppers having abandoned orders at the shopping cart, bolstering brand recognition and building trust is a core component in obtaining successful conversions. Reviews must be generated by a third party, which excludes paid endorsements, individual user comments or reviews from sites such as TripAdvisor or Yelp. The review extension should also link directly to the third-party source of the review. This means that only online reviews can be utilised in the extension, so any outstanding offline recognition, reviews or awards in newspapers, magazines or journals have to be discounted. We put review extensions to the test over a 4-5 week period, during which time we collected some enlightening results. Initially, the ads running the review extensions were shown on about 10% of all ad impressions. In terms of CTR rates, the evidence was generally positive, with one review extension increasing CTR by 66%. The upward trend was also evident in terms of conversion rates. Review ad extensions are one of the most effective ad extensions available, and should definitely be trialed. Positive reviews can only serve to increase credibility, brand recognition and brand loyalty, all of which have high potential to increase CTR. If you’re interested in knowing more about the different ad extensions that are available (we reckon there are 16 types), you can download Receptional’s free PDF: The Complete Guide to Ad Extensions.